Rick Firestone and his wife Resa have lived in their Hidden Hills home for nearly 20 years. The property sits on a hillside with sweeping views of the San Fernando Valley. The sloping hill in the backyard, however, was a landscape challenge. 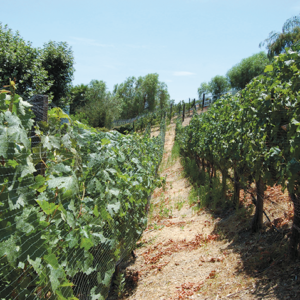 Their friends own Malibu Family Wines and planted the idea of putting grapevines on the incline. The seedling idea took root and inspired the Firestones to park 285 vines of 100 percent cabernet sauvignon grapes on their land 10 years ago. They have now had six successful bottlings. Firestone said winemaking is just “an expensive hobby” when he’s not working at Malibu Clothes in Beverly Hills. His father started the haberdashery in 1947, and he and his son Ian run the business today, keeping it all in the family. Firestone’s other hobby – photography – also comes in to play with the winemaking. His photographs don the labels on his wine bottles. Firestone grows the grapes and members of the Malibu Family Wine operation harvest them and produce the wine. Once bottled, Firestone determines the labels that distinguish the various vintages. For example, his 2015 Malibu Coast cabernet sauvignon is called the Switzerland Collection, with a scene of the Chapel Bridge in Lucerne on the label. For 2014, it is the Hawaii Collection picturing the West Maui mountains. Elfreth’s Alley in Philadelphia graces the label of the 2013 American vintage. 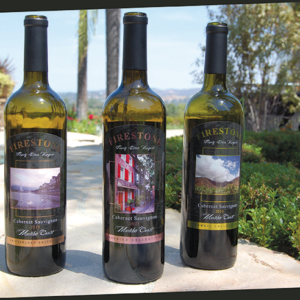 Firestone’s wines are now available to taste and to purchase at Camarillo Custom Crush Winery, located at 300 S. Lewis Rd. in Camarillo. The tasting room is open on weekends. Call (805)484-0597 or visit camarillocustomcrush.com.